Hey friends! Long time no talk, I've missed you guys! I just got back from a week of backpacking in the mountains which was so much fun! :) I'll share some pictures in a few days! Anyways happy first day of Autumn! Finally!!!! While on my little trip I picked up a few pretty stones and was hoping to turn them into something wearable! 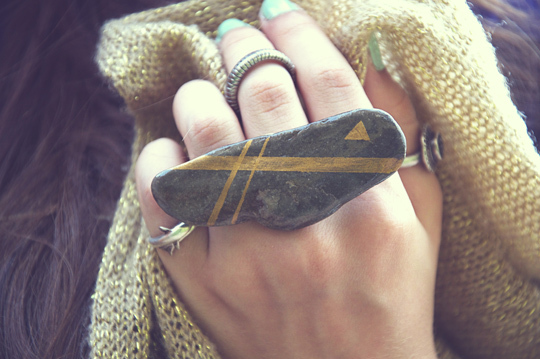 I love the way my wide gold stripe stone ring turned out! Here's how I did it! Ready, set GO! 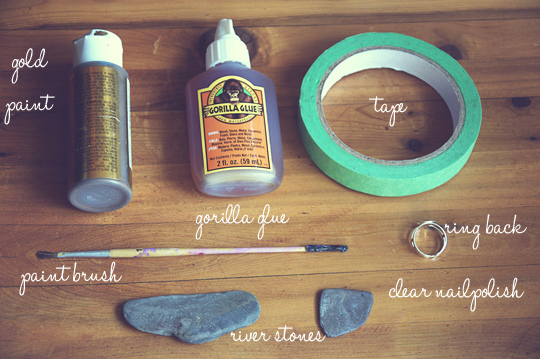 You'll Need: A flat stone, you could use sea glass too, tape, a ring back, gorilla glue, gold paint, paintbrush and clear nail polish which is optional! 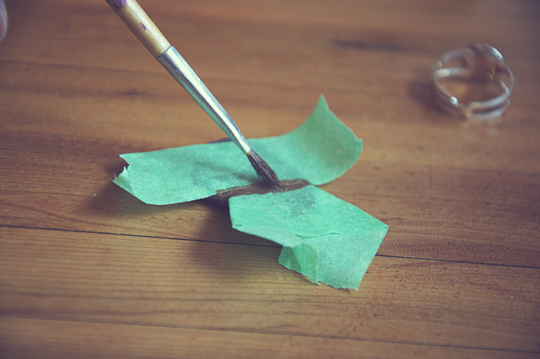 Step One: Tape off a section of your stone to create a line and paint it. Step Two: Keep creating lines and other designs until you are happy with how it looks! 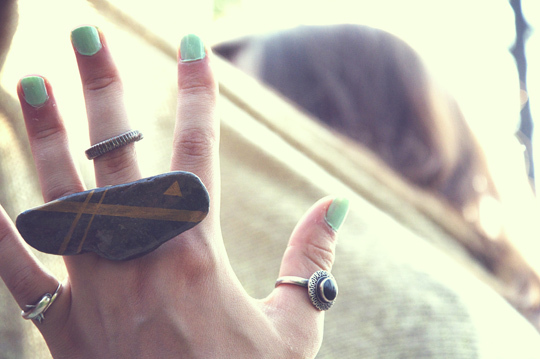 Then all you do is glue the ring back to the other side of the stone, wait till its dry and put one layer of clear nail polish on it for that extra shine! I love the big bold vibe and I'm so happy with how it turned out! Next time I'm totally trying the same technique with sea glass, it'd look so pretty! I'm so excited about the next upcoming weeks, I've got some pretty delicious things planned and I cant wait to share them with you! Oh this is so so cool! Does gorilla glue work well to keep in attached? I'm always so skeptical of glues for jewellery purposes but people seem to love gorilla glue haha! Also - LOVE the new layout!! 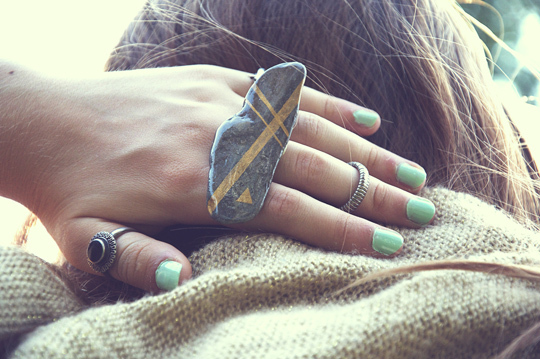 This ring is soo cool, love the pattern design. So cool! I might have to try this out. Oh wow! I love this! It's so cute and simple. I've been into rings lately so I could totally do this! Lauren!! This is sooo boheme... and beautiful.. and simple.. love it! I wanted to say that last week ~ but my broken computer wouldn't let me access the comments. 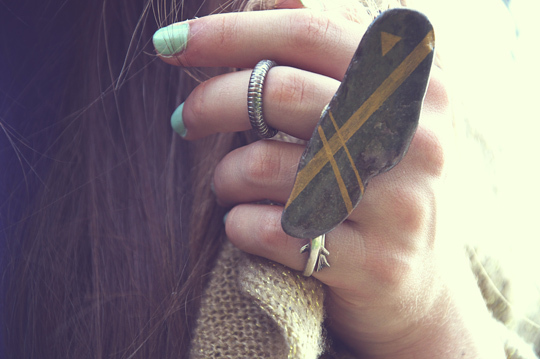 I'm posting a fabric ring D.I.Y this week, could I link to this as another cool ring option? this is a very great idea! sometimes when I stroll along the beach or river and often see nicely shapped stone and feel like collecting them, but never knew what to do with it.. There is a nice creativity. 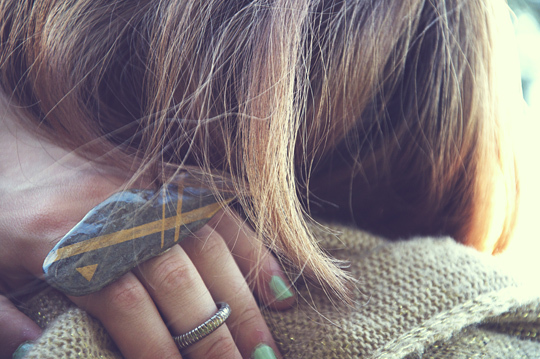 What is it comfortable for women?